Measuring bucket for professional mixing and easy paint rolling. 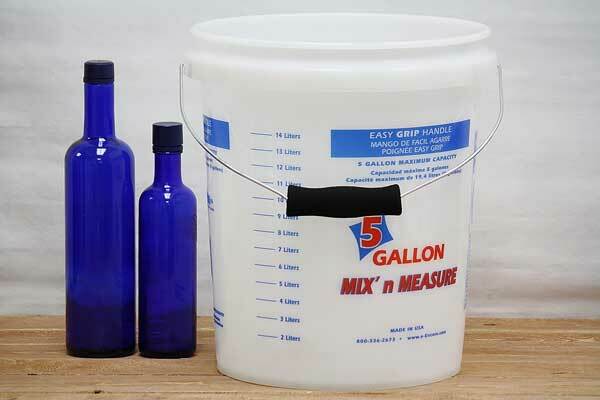 This 5 gallon paint bucket features a flat bottom for liquid stirring. Graduated liquid measurements in gallon and liter units up to 3.5 gallons and 14 liters. Easy to carry with comfort grip handle. Solvent resistant plastic. Safe for use with all paints, pastes and adhesives. Pail is made from HDPE food grade plastics. Can be ordered with or without snap on storage lid. Made in the USA. Order a handy paint grid to roll paint from the bucket onto walls.